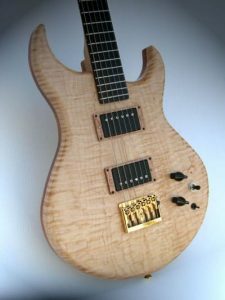 Ask Scott MacDonald why he quit a successful career in TV and film production some 24 years ago to start his guitar shop – building and repairing guitars – he offers a simple explanation. “It was an inner voice that said this is what you should be doing. I have no other answer,” he explains. Actually, the inspiration to transform rough wood into exquisite musical instruments most likely took root when he built a banjo as a college student. Then later, while working in the film business, he built a guitar from a kit. Surprisingly, MacDonald never studied guitar making or apprenticed with a master luthier. He simply attended some workshops and symposiums where he asked questions and listened to guitar makers. “I always knew I could call on people smarter than I if needed. After that, it was just time and experience learning my craft,” he says. 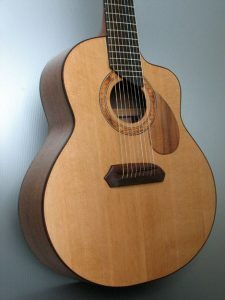 Today, MacDonald operates a successful business building and repairing guitars and other musical instruments from his shop in Chester, VT. His client list includes customers from around the globe. Every guitar he makes is one-of-a-kind. String lengths, fretboard marking, all dimensions and choices of wood are worked out for each individual. No two are alike. “Everything is designed around the guitar player. When I get to know the person, the guitar comes out of that. I study the size of the customer’s hands, the tone of their voice, how they play. The finished product is a true custom guitar that fits them like a glove,” he says. MacDonald works with a variety of sustainable wood species, avoiding all endangered species. All are stored and crafted in his 4-zone humidity-controlled workshop. He’s learned to tell how good a piece of wood will sound simply by scratching it, tapping on it, and seeing how it feels in his hands. He says it’s an intuitive thing that came with time. Humor aside, MacDonald says he can’t build a guitar unless the wood is ready for him to build it. That means controlling the relative humidity (RH) and checking the wood for moisture content (MC). To keep tabs on the RH, he uses an Abbeon Certified Hygrometer. As the RH fluctuates, he controls it by humidifying and dehumidifying his shop to keep it at the ideal range. “The relative humidity is vital. I like it to be in the 47% to 50% range. And the wood must be between 6% to 8% MC,” he says. 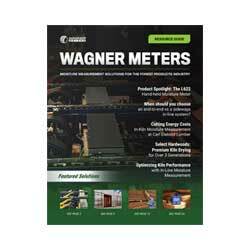 To make certain the wood is indeed ready to be worked, MacDonald always uses a Wagner pinless moisture meter. He avoids pin meters because they make unsightly holes in the wood and they don’t give him accurate moisture readings deep in the wood or across a wide area. As a luthier, MacDonald believes he’s only as good as his environment, his materials, and his tools. “That’s why I keep my shop humidity-controlled year-round, buy the finest materials, and why I bought the Wagner MMC220 moisture meter. It was the best moisture meter I could find,” he declares. “The size of the pores and the ability of the wood to take in and release moisture can be staggeringly different between species. So you can’t just put a meter on a piece of wood and know precisely what the MC is. With the Wagner, I can dial in a specific species – whether it’s ebony, maple, or spruce – and know I’m going to get an accurate reading,” he says. Talk to MacDonald and in short order you know he’s passionate about making guitars. You soon sense his love of transforming rough wood, as if by some form of alchemy, into beautiful, vibrant instruments – each with its own individual characteristics and personality. Anyone who has ever played a true handcrafted custom guitar from S.B. MacDonald Custom Instruments knows it can “sing” in sweet, rich, lovely sounds, and become a “voice” for the player. 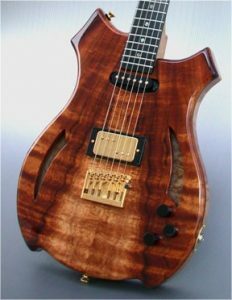 To learn more about MacDonald’s work, go to www.customguitars.com. To choose a wood moisture meter that’s right for your projects, visit https://www.wagnermeters.com/moisture-meters/comparison-matrix/.